Almo Nature HFC - Cuisine Kitten are meals of fresh meat for young cats, made from all natural ingredients with added vitamins and minerals. Designed especially for kittens, Almo Nature HFC - Cuisine Kitten is available as fresh meat. All of the ingredients used in these diets are natural, the meat is free from hormones and antibiotics during breeding and the fish is freshly caught from the sea (not farmed). Almo Nature HFC - Cuisine Kitten has added minerals and vitamins, for a healthy and tasty meal, which meets the nutritional needs of kittens. Almo Nature HFC - Cuisine Kitten meat is preserved in its own cooking liquid, to retain the nutritional value and flavour. No chemical preservatives or dyes are added to the meals in the Almo Nature HFC - Cuisine Kitten range. 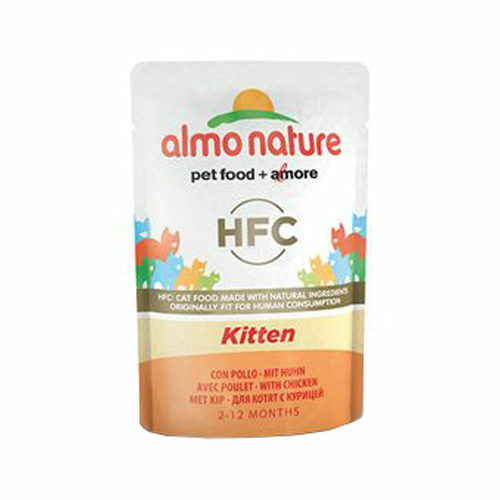 Almo Nature HFC - Cuisine Kitten is available in 24 x 55g pouches. Almo Nature HFC - Cuisine Kitten: chicken (40%), chicken stock, rice (8%), cheese (3%), chicken liver (2%), sunflower oil (2%), dried egg products (2%), vitamins and minerals, salt (0.1%), choline chloride (0.05%). Nutritional additives: Vitamin A 9300 IU/kg, Vitamin D3 300 IU/kg, Vitamin E 50 mg/kg, Vitamin K3 0.1 mg/kg, Vitamin B1 15 mg/kg, Vitamin B2 2 mg/kg, niacin 20 mg/kg, pantothenic acid 4 mg/kg, Vitamin B6 2 mg/kg, Vitamin B12 0.01 mg/kg, biotin 0.05 mg/kg, folic acid 0.5 mg/kg, manganese 2 mg/kg, copper 0.8 mg/kg, iodine 0.05 mg/kg, selenium 0.03 mg/kg, zinc 22 mg/kg, iron 21 mg/kg, calcium 2100 mg/kg. Have you used Almo Nature HFC - Cuisine Kitten before? Let us know what you think about this product.